The noise about payday filing is starting to get louder. But what exactly is it and how does it impact your business? Employee pay information – similar to what you currently provide in your current employee monthly schedule (IR348)return. This includes gross pay, pay period start/end dates, ESCT, PAYE amount, KiwiSaver amount, ESCT amount, student loan amount, etc. Additional details for new and finishing employees – details for new employees include their name, IRD number, tax code, date of birth, start date and contact details. You only need to enter the cease date for employees who have finished. This information can be filed at any point, you do not need to file it at the same time as pay run information. How do you file this information? In limited circumstances – by paper. Note: this option is not available for employers who process more than $50,000 in PAYE and ESCT each year. How often do you have to file? Payroll information is due within two working days of the payday if you file electronically. If you file using paper, you have 10 working days. Note: regional holidays like Wellington Anniversary Day are considered working days, but other public holidays and the period 25 December – 15 January each year are not. 1 April 2019 will see payday filing become mandatory for all employers. Two core drivers for this change include the sharing between Government Departments and Inland Revenue’s drive to better calculate individual’s tax and entitlements. This will have flow-on effects to Working for Family Tax Credits, Child Support payments, and also Work and Income benefit payments as timely information will be readily available to use in calculating these. 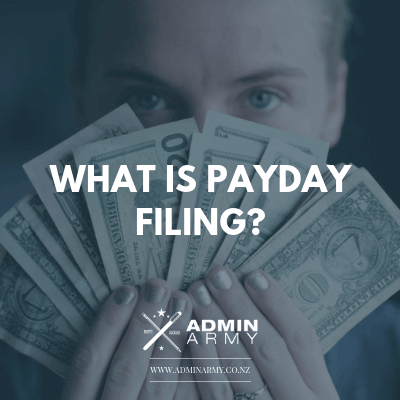 What does payday filing mean for your business? Other providers will require you to download a file to be uploaded through the myIR portal, which will add a few additional steps to your current payroll process. Those providers who are not payday filing ready – these will mainly be obscure, overseas providers. Most main payroll software providers in New Zealand have already indicated that they will be payday filing ready by 1 April 2019 if they are not already. One of the most common misconceptions about payday filing is that you will now have to pay Inland Revenue at the same time (or within two days) as paying your payroll. This is not true. Payment of PAYE, student loan and KiwiSaver deductions will remain due once or twice a month as you do now (standard for small businesses – due 20th of the month following). Are you worried about the increased workload from payday filing on your business? The Admin Army team would love to help. Alongside our bookkeeping services, we offer a range of payroll processing packages – you provide the payroll software and employee information (e.g. hours worked, etc.) and we take care of the processing and payday filing for you. Get in touch to talk about how we can take care of your payroll and payday filing today!